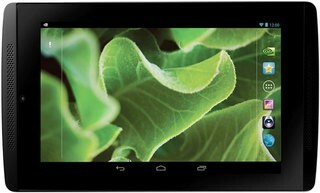 Advent Vega Tegra Note 7"
Nvidia wants to compete in the tablet market with the Tegra Note 7. Its price means that it has to face the very good Google Nexus 7, but it cannot take the top position. The much more expensive Apple iPad Mini Retina is also on a completely different level. However, the review unit can surpass the rest of the competition. Well, the first reason is the IPS display with wide viewing angles. Besides a subjectively good picture with a decent contrast and high luminance, you can also use it outdoors. Web browsing, movie playback and gaming are really enjoyable. The experience is also supported by the comparatively good stereo speakers at the front. Speaking of gaming: The Tegra 4 is still well suited for smooth gaming experiences with all current titles from the Play Store, and TegraZone also offers games that are optimized for the SoC. The general application performance can convince us as well, even though some other manufacturers offer even faster devices. The Tegra Note 7 uses the latest Android 4.4.2 KitKat operating system. The connectivity is decent with micro SD, micro USB 2.0 and micro HDMI ports. A good WLAN signal as well as GPS and Bluetooth 4.0 complete the connectivity. The Tegra Note 7 also offers a precise stylus with the corresponding software. We are not completely convinced by the inconsistent build quality and the mediocre cameras. Similar to the Google Nexus 7, we would have liked to see a higher display resolution. We can still recommend the tablet because of the many positive aspects and the good price-performance ratio if you can live with the mentioned drawbacks. Potential buyers should still have a look at the Google Nexus 7. The general usability of the Tegra Note 7 can be enhanced by plugging it into a TV via its mini- HDMI port. This will be of particular interest to gamers who wish to take full advantage of its fast processor and who don’t want to be limited to its relatively small screen. You can also pair up a compatible gamepad via Bluetooth and play a bunch of great titles. Nvidia curates optimised games that take advantage of the processor’s power in its TegraZone portal app – a mini app store. As a result, the Tegra Note 7 is a decent console alternative that can be fun for all the family. Sound quality is something of a hindrance though – speech in particular seems to be too quiet, despite playing with the audio settings – and its screen is a little dim. Nonetheless, it’s a contender. Aside from some clunky design issues, the Advent Vega Tegra Note 7 is a powerful and punchy little machine. If you’re after a compact and affordable tablet, its speed sets it aside from its rivals as a device that’s great for gaming, customising images and browsing the web. The Advent Vega Tegra Note 7 is a mixed proposition. It's clear that costs have been cut in the choice of screen and the tablet's overall build quality, but with a price this reasonable, top-notch performance and proper, pressure-sensitive stylus support, it's possible to overlook such tribulations. It certainly offers something different to its rivals. If you thought Google had mastered everything in its own Nexus tablets then think again. Nvidia has pushed the design brief beyond a typical budget Android tablet and shown that power, flexibility and a great Android experience can be had for a price that makes it accessible to everyone. You can get the Tegra Note 7 16GB model for £169.99 and that is great value for money. The Nexus 7 2 is more expensive at £199 and its main advantages over the Note 7 is the vastly superior screen quality. The same can be said about the Kindle Fire HDX 7, although you will have to be locked into that Amazon ecosystem. For a first attempt at making a tablet, the Note 7 is an impressive starting point for Nvidia. If it can ramp up the screen resolution and some of the build quality, the Nexus 7 could have a small tablet fight on its hands. The Advent Vega is the star of the show as far as Android Tablets go. It delivers on it's low price and high specs. Forget what you have read on other reviews about the build quality, it's fine! Grab a 32gb MircoSD card and whack it in. Use it lots and you'll get used to the fiddly button arrangement and keep it up to date with the latest firmware and things will get smoother. Finally visit Paul's forum at Modaco, get the customisation mod and you'll never look back. 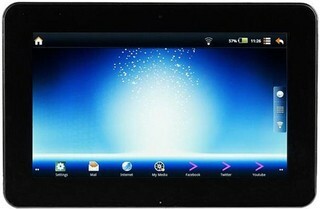 This is simply great value and the best 10" Android Tablet on the market. It would be kind to explain away the Advent Vega as an over-enthusiastic attempt to get a knock-down price iPad into the hands of the masses in time for Christmas. But this poor copy of Apple’s tablet appears more as another embarrassment to the Dixons Stores Group and its house-brand Advent. Like the Toshiba Folio 100 tablet that DSG is alleged to have removed from sale after so many customer complaints, the Advent Vega is not especially fit for purpose. The key issues are that it cannot download new apps from the Android Market, its screen is nearly unviewable at most off-axis angles, and the promised Adobe Flash support is so flakey it had to be removed from future stocks of the device. There may one day appear tablet PCs cheaper than the Apple iPad that deserve attention. Until then, the Advent Vega joins the pile of cheap cash-in products that we’d recommend avoiding. There are times – web browsing, for instance – when we had to remind ourselves how cheap the Vega is, given its performance lived up to other far more expensive tablets. At other times, the cost-cutting required to hit that price reared its head, with the lacklustre viewing angles of the display being a particular frustration. Reading text or looking at photos or video is simply a more enjoyable experience with the iPad or Galaxy Tab’s displays. Out of the box, there’s definitely a sense that you get what you pay for. Advent could have done themselves major favors by throwing in some custom apps for social networking, IM or video calls, or by preloading things like Fring or Skype. Instead, there’s a webcam that only gets used to take vanity stills and a processor that’s massively under-utilized. Spend some time tinkering, however – whether that be the basics of installing a third-party app store, or going the more complex route of flashing an alternative ROM – and the Vega proposition is far more appealing. That appeal seems to have caught the Android dev community, for whom Advent’s limitations are of no real consequence. Mainstream users, however, will likely find the Vega underwhelming in its pure form. Visit the Advent Q&A Forum to get answers, ask a question or help others.